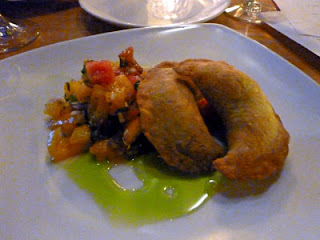 Last night (September 24, 2010) saw the "soft" opening of del Alma, the successor to Loca Luna. With the departure of Adam Kekahuna, the restaurant has acquired a new chef, Mitchel Rosenbaum, formerly of La Mesa Grill in Las Vegas. The cuisine is now a more traditional Latin one, which is probably for the best; I suspect that Kekahuna's "Pacific Rim/Latin Fusion" style was just a little too "out there" for Corvallis. The wine list offers a good selection of whites, most moderately priced. The selection of reds may be a bit too heavy with Oregon Pinot Noir and is deficient in moderately priced Cabernet Sauvignon and Cabernet/Merlot blends. From Washington's Columbia Valley there is Little Bear Creek's Cabernet/Merlot blend for $32, but the other four wines of this type range in price from $63 to $96. There are plenty of good lower priced Cabernets out there, such as 2007 Louis Martini Sonoma County, 2006 Robert Mondavi Estate, and 2006 BV Rutherford, and with three beef and one lamb entree on the menu, the folks at del Alma should consider adding these or comparable wines. We selected a moderately priced ($28) Tempranillo, the 2000 Anciano. This was a bright, fruity wine with more body than a Pinot Noir, and it worked well with our entrees (beef and lamb), though a Cabernet would have been better. After being seated, we were brought bread with three dipping sauces. The bread, baked on the premises, was excellent, crusty on the outside and chewy on the inside. The three dips were a olives/mushroom chutney sort of thing, a puree of yellow bell pepper and garlic, and a seasoned bean puree. All were good. Appetizers are found under the Tapas section of the menu. I ordered the Dungeness Crab, Shrimp, and Spinach Empanada ($8; see photo above). My first bite was of the Empanada alone and the pastry seemed a little dry, but I discovered that adding a bit of the salsa to the fork resulted in a perfect balance, with a delightful combination of flavors. Kathy ordered the Florres Relleno de la Calabaza ($10), this being a fried squash blossom stuffed with Dungeness crab, peppers and cheese. This was likewise excellent. The menu lists three salads and two soups. We didn't try any of these; perhaps on a future visit. The entrees range in price from $16 to $29. There is only one vegetarian item, the El Bosque, a mushroom ragout, and the restaurant should consider adding at least one more so that vegetarian customers don't have to order the same thing every time. Kathy's entree was the Borrego Borracho "Drunken Lamb" ($24), this being a braised shank served with tequila soaked apricots and vanilla whipped sweet potatoes. The apricots turned out to be few and far between, too few for the "drunken" description to apply to the entire dish, and the lamb was served medium rather than the medium-rare that Kathy had ordered. Nevertheless it was tender and flavorful, and the potatoes were creamy and subtly flavored. 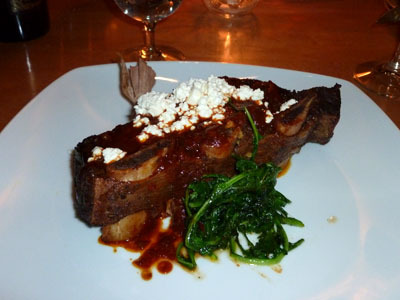 I ordered the Beef Short Ribs ($24; see photo). These were excellent, moist and tender, with a distinctive "roast beef" flavor, but something went wrong with the accompanying wild mushroom tamale, because the contents were dry, powdery and unpalatable. Fortunately Kathy's serving of potatoes was a generous one and I took a small helping of those. For dessert Kathy ordered the Classic Flan ($8), which was supposed to be served with almond cookies and whipped cream but instead came with slices of papaya. Nonetheless, it was very good. I had the cheesecake ($8), which was perfect in texture and flavor. Except for the powdery mushrooms in the tamale and, on Kathy's entree, the scarcity of drunken apricots and the slightly overcooked meat, (all of which can hopefully be chalked up to opening night issues), it was an excellent meal. Del Alma is off to a good start, and will hopefully only get better.